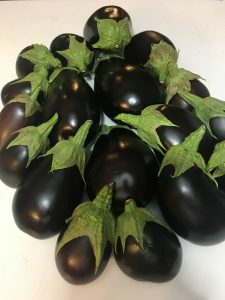 Eggplant Rollatini is a delicious and healthy alternative to lasagna. 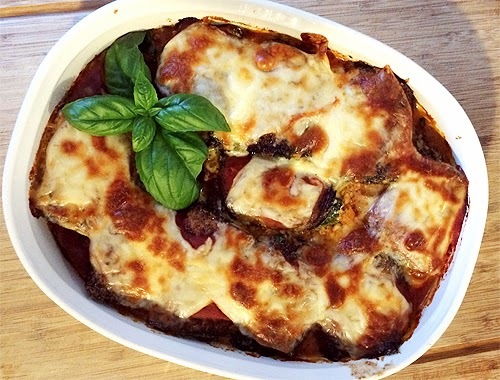 Check out this receipe for a fun way to use your freshly harvested eggplant and tomatoes! Drain eggplant on paper towel if fried. After the eggplant slices have cooled (about 10 minutes) begin rolling. Filling: In a large bowl, combine 2 cups ricotta, 3 tbsp. Parmesan cheese, 1/2 cup shredded mozzarella, herbs, garlic, 1 egg white, salt and pepper, and blend well. To Roll: On each slice, put about 2 tablespoons of cheese mixture and spread it on the eggplant. Next, place a slice of prosciutto on top of the cheese (optional) and then roll. Repeat with all eggplant slices. Coat the bottom of a deep baking dish with three quarters of the tomato sauce. Place the rolled eggplants on top of the sauce in the bottom of the pan. After filling the pan, put the remaining sauce on the top of the eggplant. Sprinkle some more grated cheese on top. Finally, place the slices of mozzarella cheese on top of each rollatini. Bake at 400 degrees for about 20 minutes. (If the eggplant was baked, cook for 30 minutes). The cheese should be melted and starting to golden brown. Excellent and healthy alternative to lasagna.